Welcome to Billy’s Picture Book! 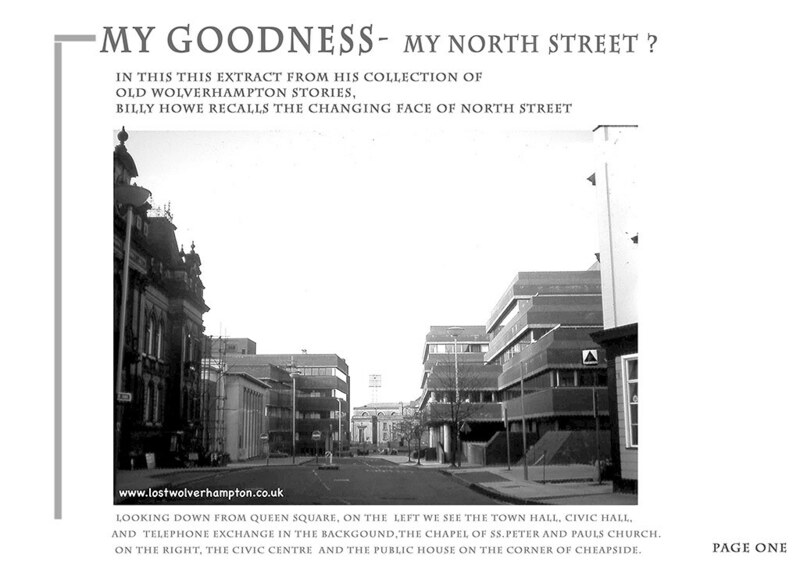 In this new series, I hope my pictures and stories will illustrate the many changes which have taken place in Wolverhampton since 1750, particularly in relation to the street scene and general landscape. 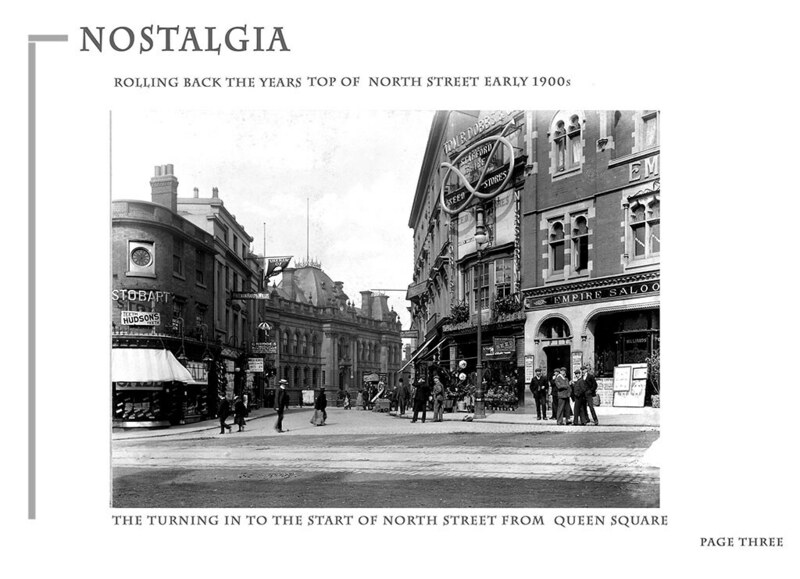 North Street, whilst still containing some interesting old buildings, has lost its historic street pattern and landscape and there is no coherent architectural or historic character anymore. The most significant of these changes are the ones made to St Peter’s church, which is now compromised by a large 1970’s office block (albeit replacing an earlier Victorian Market Hall). Most young people today would be astonished to know that a road that is now essentially two cul-de-sacs, was for many years one of the major roads leading to the town centre. This area around the northwestern side of St Peter’s has undergone many changes over the last two hundred years, especially during two major phases of reconstruction. The initial phase came began in the middle of the 19th century, when the Exchange (1852), Market Hall (1853), and the Town Hall (1869), were built. Later, a new open air Market Place was established, followed by the Wholesale Market in 1902. Despite the construction of the Civic Halls in 1938, the most significant scheme of works in the twentieth century were later and were precipitated by the construction of Wolverhampton’s inner ring road. To make way for the scheme, the Market Hall, Market Place and Wholesale Market were demolished and replaced by today’s Civic Centre/council offices. 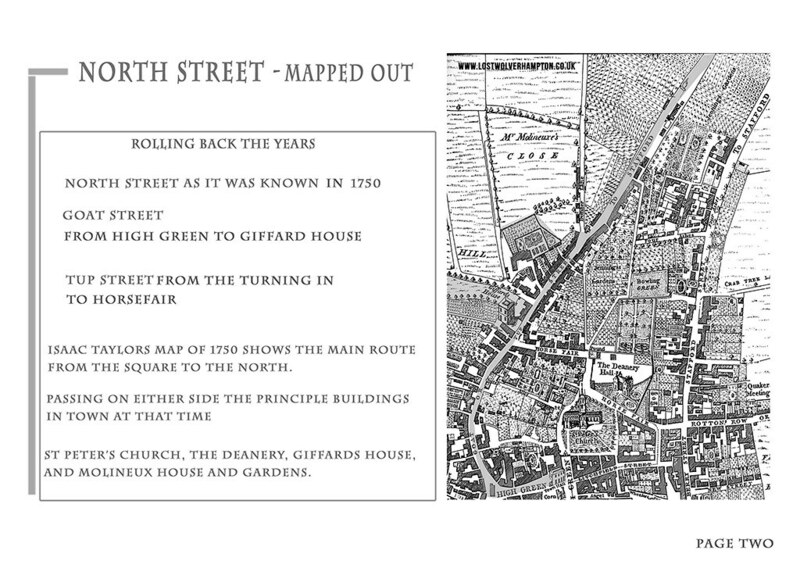 North Street, which in early days was known as Goat Street, or Tup Street, led directly from High Green (Queen’s Square), passing the Deanery in Horse Fair. In Medieval times, the route was the town’s main road to Stafford and the North. By 1750, North Street’s its location, immediately adjacent to the medieval church, North Street had seen a steady growth in building for over 600 years. In close proximity to the church were the Deanery, and Prebend Houses of Wobaston, Monmore and Willenhall. It has been suggested that in the 15th century, it may have had the appearance of an ecclesiastical close. The image above shows an early view from the top of Victoria Street, opposite the entrance from the square in to North Street, where in the early days this spot was known as the “Roundabout” and was removed in around 1850. 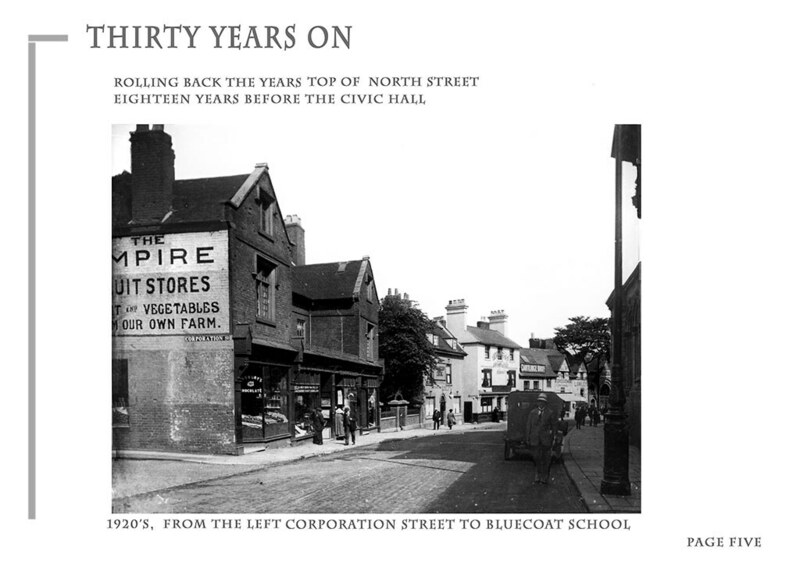 Sixty years later, at the turn of the last century, this first half a mile of North Street housed most of the prominent buildings of the town, including the Town Hall Fire and Police Station, The Retail and Wholesale Markets. It also included probably the two finest buildings outside the immediate town centre, in the Molinuex Hotel and Giffard House. Here at the top of the street next door to the newly opened Empire Music Hall, was the largest representation of the Staffordshire Knot then made – upon Messrs. Tom. B. Dobbs & Co’s Staffordshire Seed Stores- it measures over twenty feet across, and is hand-made of copper. 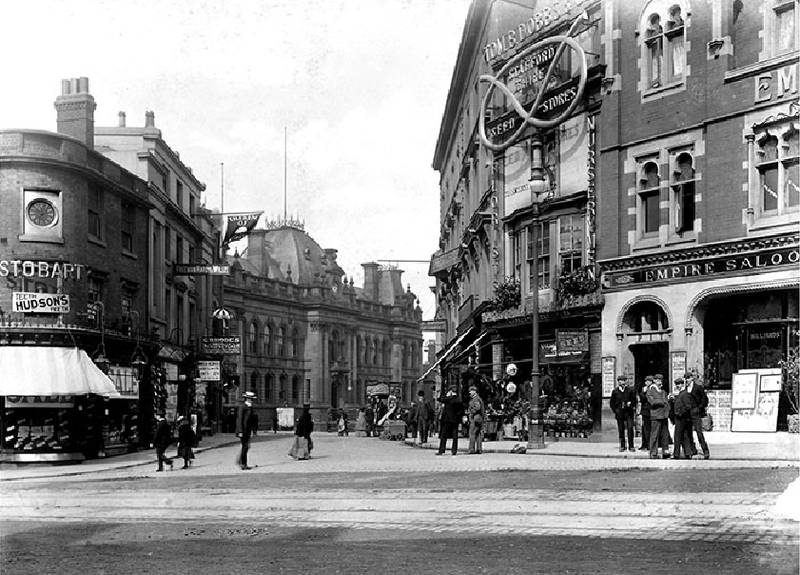 The photograph above dates to c. 1890 and brings out the contrast between the Victorian town hall, built in 1871, and the Prebend House on the corner of what was later to be Corporation Street. 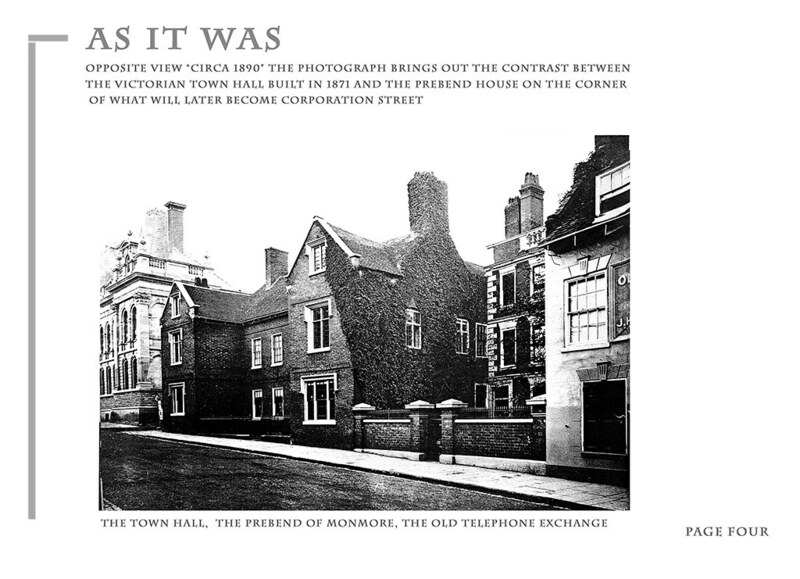 The house was, in fact, the town house of the Prebendaries of Monmore in Wolverhampton Church. Behind it then were the Upper and Lower Gardens. Lying back with the walled gardens between the Prebend House and the Old Mitre Inn, is the splendid 18th. century house, once the residence of Samuel Stubbs, surgeon. At a later period it became the Wolverhampton telephone exchange. This view of North Street 1920’s from Corporation Street to the Tudor Building and Bluecoat School shows the distinct cobbled entrance to Corporation Street. The former Prebend House on the corner, with the adverts on the side wall, is now seen here converted into four retail units. The first of these is The Empire Restaurant, managed by Mrs Franks, and next door is Danny Cohen, a furniture dealer. The following two businesses were Henry Corns, drapers and finally Greens’, a tailors shop. The low brick wall, trimmed with pillared gate posts, fronted the entrance to a splendid 18th century house, at this time home to the Wolverhampton telephone exchange. This little block will eventually become the site in 1938 for The Civic Hall. The large tree in the front garden of the telephone exchange, is partly covering the sign for “The Old Mitre” Temperance Hotel, at the moment in the capable hands of Mrs Taylor, the licensee. Hidden in between the Old Mitre and Jessup’s hotels was Mitre Fold, in those days just a small carriageway, home to a few small terraced houses. Finally, a Mr Stokes, the tenant, is doing just as equally a sound job next door at “Jessups Hotel”. Coming soon – The arrival of the Civic Halls and more! You will find Myself and perhaps others will find many pictures to remind you of your holiday trips including The Colonades (The Arches) as they are known.